Giddy up MB Fatties! 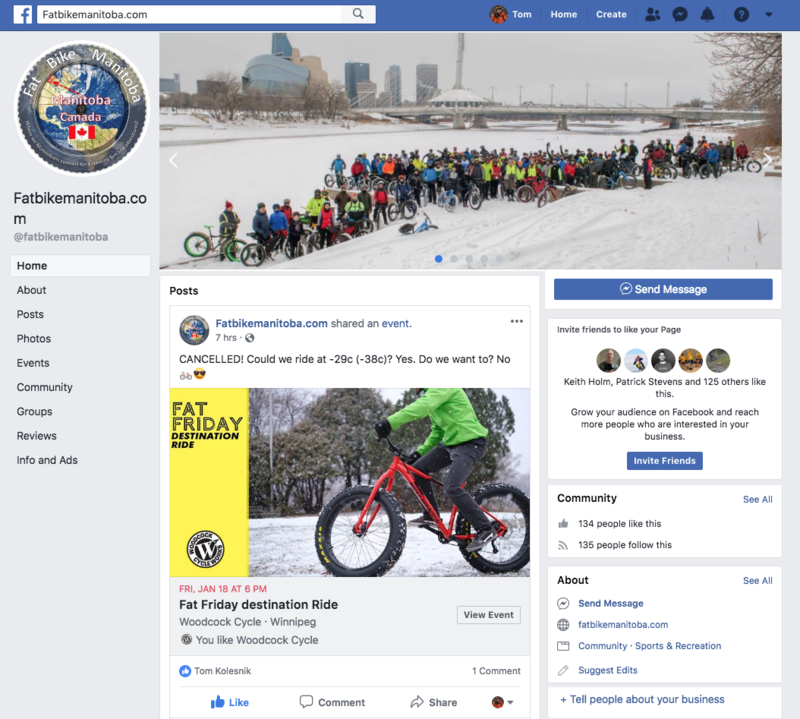 Thanks to Dave Cushnie and Gord Buhr, there is a call to gather at Grand Beach Prov Park for some Fatbike riding on FB-Specific Groomed trails with some BBQ Fest Fun to follow! 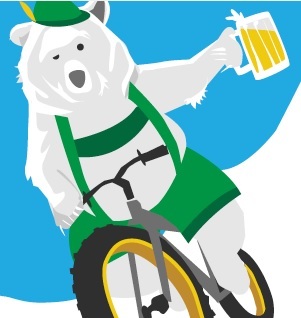 Be ready to ride at the GBPP Winter (XC Ski) Trailhead Parking lot at Noon (12 Bells) tomorrow Sunday 11 March 2018 – Eh! Take the East Gate exit to drive north when you approach Grand Beach Prov Park. 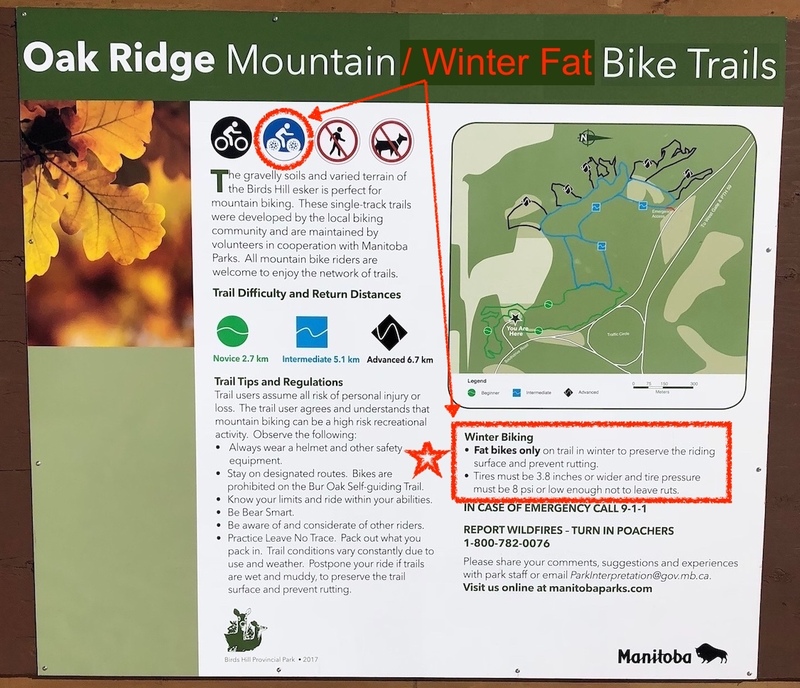 We will be riding on a Fatbike Single Track route that does not conflict with any of the XC Ski trails (since they are still being groomed and we do not have MB Parks access granted). This route has been groomed manually by a number of good folks like Dave Cushnie, Gord Buhr, Marty Roy, Erich Enns, Kurt Lehmann, Wayne Bishop and others I may not specifically know to credit. 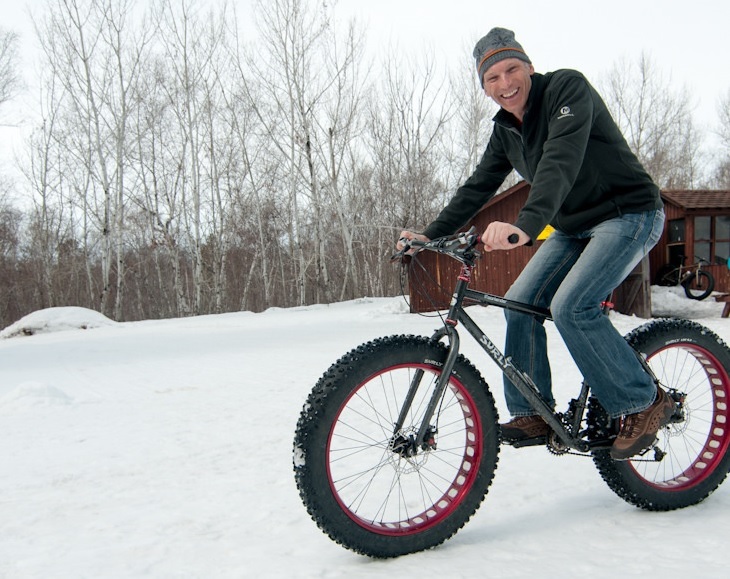 To ensure that you enjoy your trail ride and don’t sink into the packed snow too much (and create ruts), please bring a fatbike (3.7 inch wide or wider tires) and keep the pressure low (8 PSI or lower). 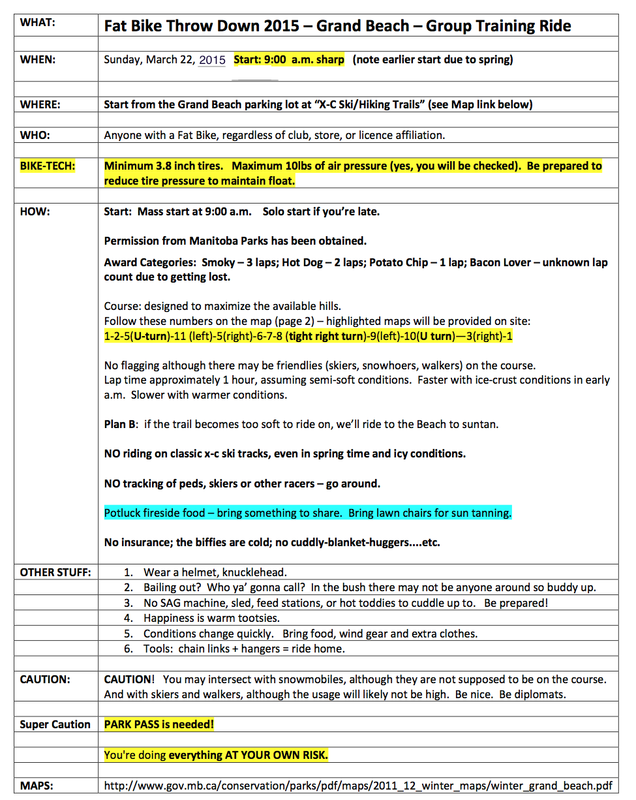 Note: An update from Wayne Bishop – he has stated that it is ok to go ride! From previous: The advice from Wayne Bishop and 2 Wheel Revolution is to stay off of the groomed trails for the immediate future. Any traffic, whether fatbiking, pedestrian (walking and running), pet walking, skiing, will destroy the base that is being attempted to be set in the first few weeks of winter. Wayne will let us know when is a better time to ride the groomed trails. For more information please contact Wayne directly (he is on Facebook). Grand Beach Prov Park FatbikeGroup Ride & BBQ: Oh So Sweet it was! Our Grand Beach Prov Park Group Ride & BBQ yesterday (26 Mar 2017) was Oh So Sweet! 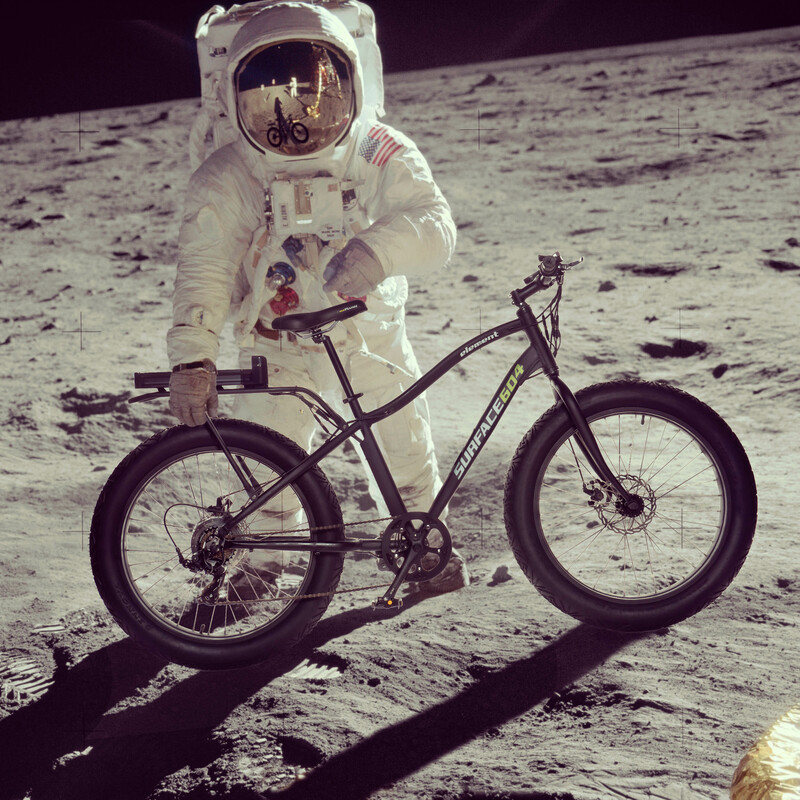 Lucky for us, Gregory ‘G-Mac’ McNeill joined us to ride and take tons of pictures … which is AWESOME! Thanks again G-Mac for snapping, processing and sharing. 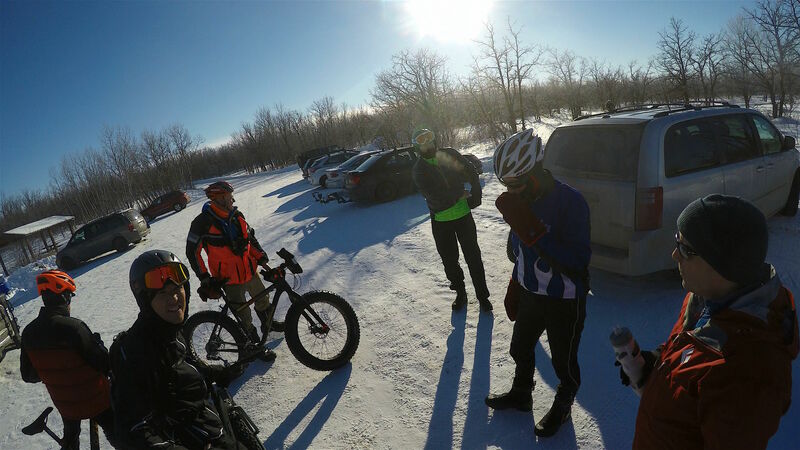 Here it is folks, probably our last chance to gather the Fat Bike Manitoba ‘Herd’ for a group ride on what remains of the groomed winter ski trails at Grand Beach Provincial Park. Btw, we have access because grooming has stopped for the season, but some skiers may still be on the trails. 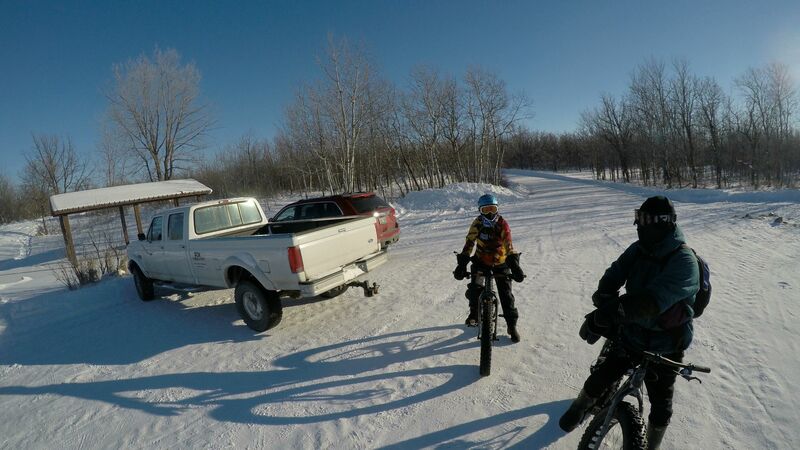 We have ridden there in past years at the end of March with similar weather conditions and had a great time (even when it was a bit soft snow or icy conditions). Our chat at Birch indicated this Sunday works for a bunch of us. So, giddy up Fatties – who’s in? 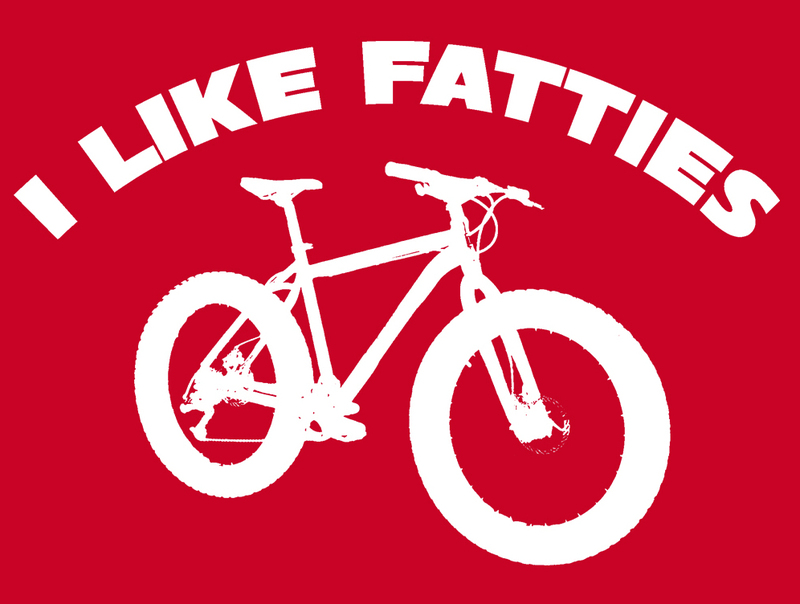 WHO: Anyone with a Fat Bike. Minimum 3.8 inch tires. Maximum 10lbs of air pressure. Be prepared to reduce tire pressure to maintain float. POTLUCK BBQ: We can use the warming shacks and potbelly stoves to cook fireside food, smokies/bacon/scallops,potatoes etc in frying pans (bring one) and/or bring a portable stove. Bring some food and drink share. There are a couple picnic tables, but a few lawn chairs would be handy. It was a great Saturday to be at the Bur Oak Trails at Bird’s Hill Park. There were almost 10 fatbike riders out there, navigating the soft snow freely given to us by Mother Nature over the last week. The soft conditions had the riders dial in their pressures once on the course. 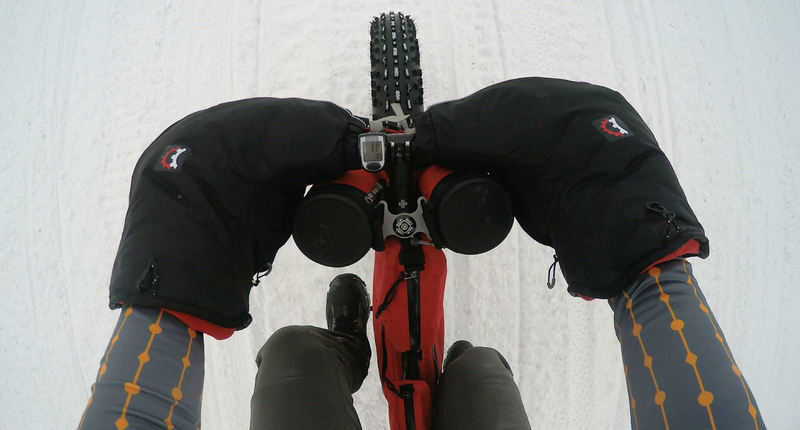 It is easy to deflate in the cold, rather than inflate, so deflating a higher pressure is the norm out on these winter rides. “I think most of us were running 4 or 5 psi.” states Mike. Many local people were out there today, including Greg Carrigan, Gilles Paquette, Steve H., Tim Woodcock, Mark Kleinholz, Jon Letkemann and finally Mike Vandale. 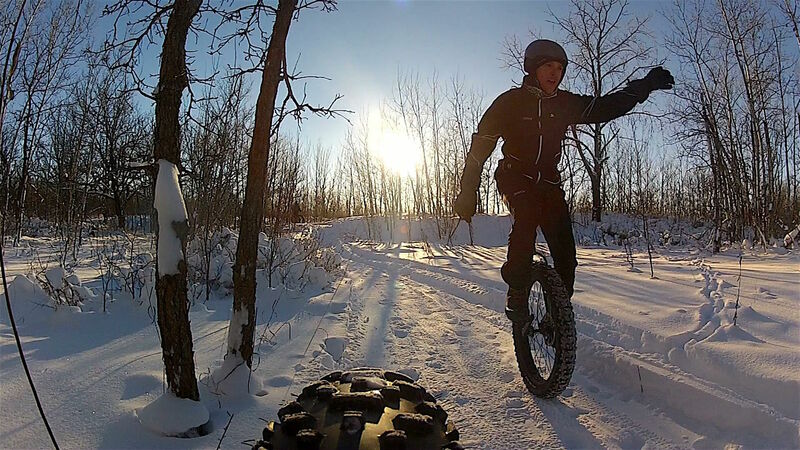 Tim even convinced a few snowshoers to ‘come to the dark side’ and try out some fatbikes to see how they are. These park adventurers looked interested and seemed to want what us fatbikers already have – fun! Today’s ride on groomed trails could not have happened without the steady work of Pete Romeo and others like John M. (who was snowshoeing today – packing the trail). Many thanks goes out to these people. Contact Woodcock Cycle for more details. 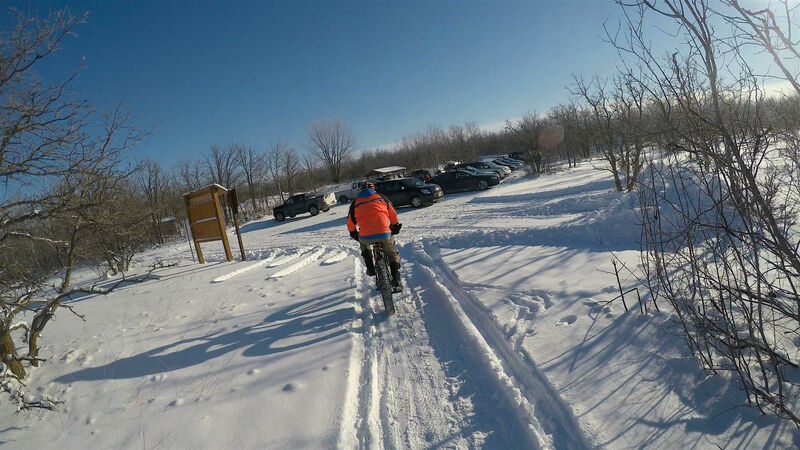 This past Sunday was a great day for us fatbikers in the Winnipeg area of Manitoba, as we got the chance to ride GROOMED WINTER FATBIKE TRAIL again in our own ‘backyard’ on one of our favourite trails … (former Bur Oak Trail – now called “Oak Ridge Trail) at Birds Hill Provincial Park! Now we’ve ridden this trail in the winter before, having packed it by snowshoe and then riding our fatties slowly round and round and round until it was possible to ride with ‘flow’ … so it was today with a bit more packing making it more groomed than usual. The early morning lighting and fresh snow on the trees had created those special winter vistas that you only really get to appreciate when you are out on the trail. Actually, it’s always a good time for a hot apple cider break when Gregory’s ‘at work’! Angie W. and Chris F. showed up ready to roll with goggles, mitts and balaclavas at the ready (excellent start!). So I lead off onto the main groomed section … north from the trailhead parking lot, but accessed first by going out the west side of the lot by the trailhead sign and then taking the first right onto the singletrack trail for a short east leg of 100 metres before the trail heads north and west. Chris was right behind me on the way out so he was in view of my rear GoPro video camera. We met up with Keith Holm’s crew and more introductions to our fun community of fatties were in order and partaken. One year is all it took. Wayne Bishop and his 2 Wheel Revolution have done many things in the past and been involved in many different types of racing, from mountain bike racing to scramble motor cross and fatbike racing. One year ago, a few local fatbikers got together for a ride at the Grand Beach Trails. Bishop’s name came up, and a few of us had good things to say about him. ‘He is a good man’ was the common theme. The group then decided to support him as best they could from then on. Today, many local racers and enthusiasts appeared at Bird’s Hill Park’s Bur Oak trails, to pack down the trails with snowshoes, as per Bishop’s request. Sunday, 8:30 a.m., ‘be there’ – was understood. 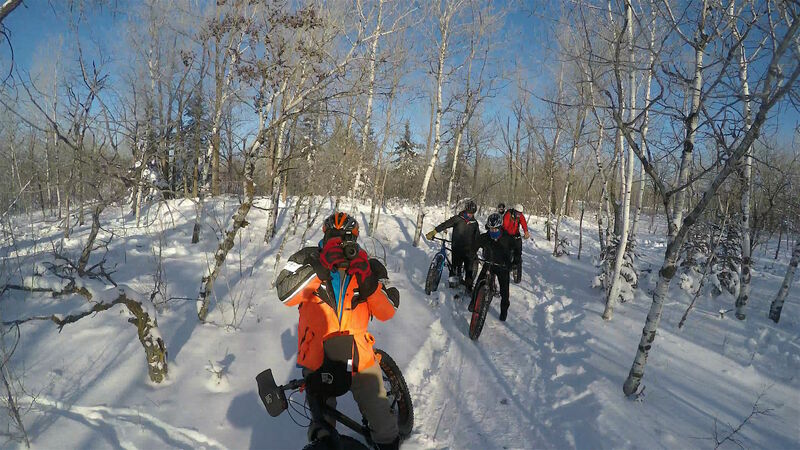 After the snowshoe people (snowshoers) did their ‘thing’, more fatbikers appeared, to do their part and ride the trail, further packing the snow down as per Bishop’s request. Some of the snowshoers had family commitment and other commitments for the afternoon, so the torch was passed on to the cyclists. Wayne thanked those he could today, but it is we in the community who thank him. Without him, this would never have happened. 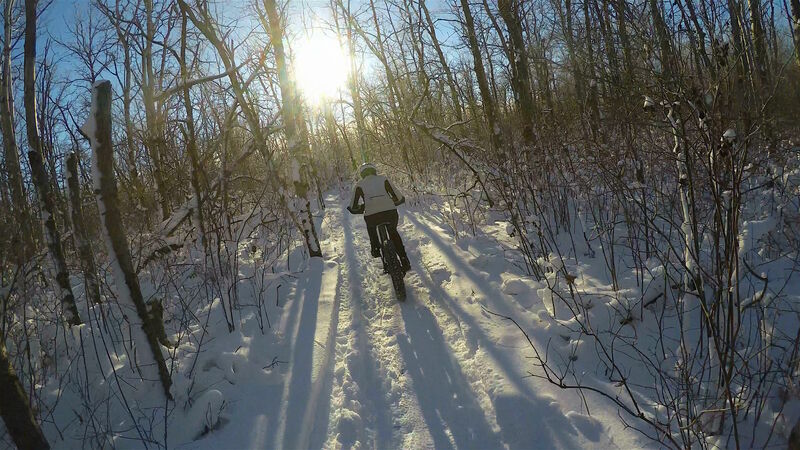 Wayne Bishop and 2 Wheel Revolution are planning to be out at Bur Oak by 9:00 AM and packing-grooming the trail by various means (snowshoe and fatbike) until around 11:00-ish. 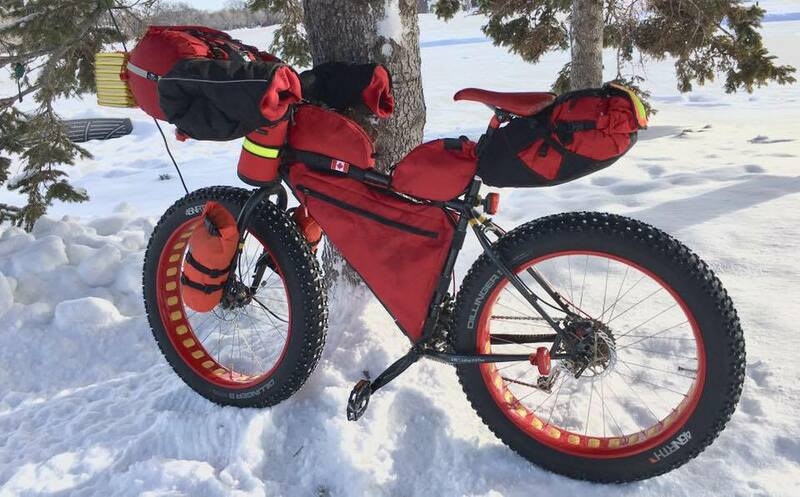 Fat bikes only, please (borrow, don’t steal, one if you have to). Narrow tires (less than 3.0 inches – though 3.7 and more is ideal) can and usually do ruin soft snow trails. Remember the Park Pass! !” Btw, it looks like at least a ‘six-pack’ of fatties are already planning (says Fbook) to attend. During the summer, whether they be trail runners, hikers, or dog walkers, local people enjoy the Bur Oak trails at Bird’s Hill Park. 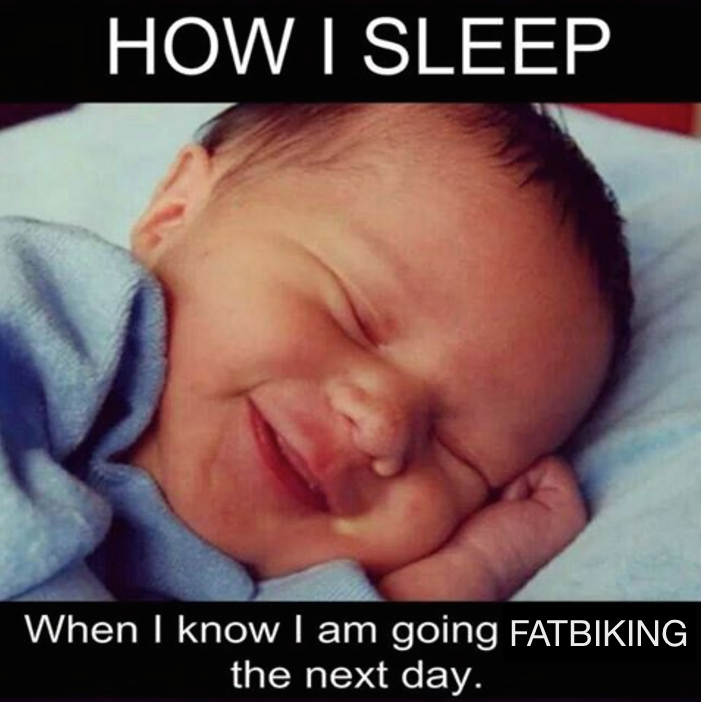 Last Sunday was no different, with a friendly invitation sent out via Social Media for fatbikers to meet-up at 1 p.m., and take it from there. I was there, Pete appeared after seeing my car, and we just started riding the trails and talking. Nice easy pace, talking about everything. 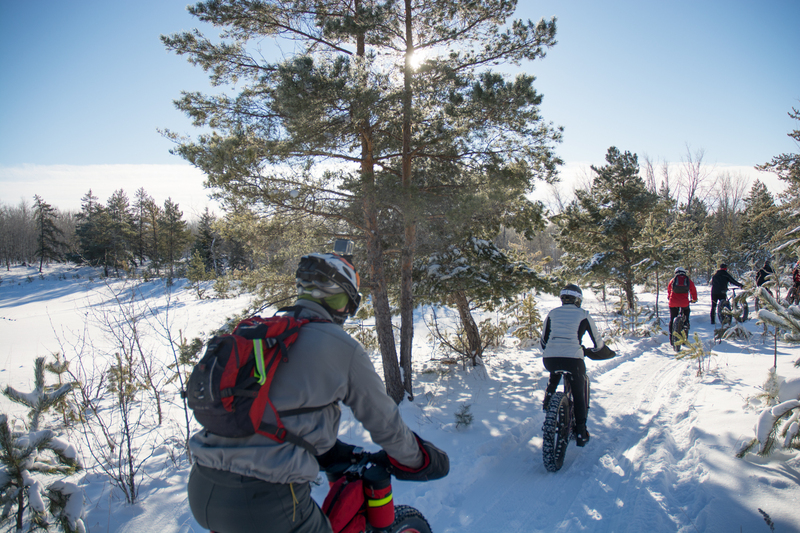 With fatbiking, you can go as fast or as slow as you wish, and it’s so quiet in the wilderness that you can have a conversation with someone even if they are in front or behind you. Dave from Stony Mountain appeared, proudly riding his new Rocky sportin 4.8 tires, and the three of us continued around the course. There was light snow cover, so the large tree roots were still exposed in some areas, and these can be slippery and tricky to go over. I just prepared myself to put a foot down and took my time. No rush out there. I still wiped out a few times. The trail is getting better groomed with the fatbikers. We met one trail runner, who was friendly and helped us take some pictures of some newcomers to Bird’s Hill Park (BHP). Igor and his friend were curious about what we do, and I let him ride my bike – I think he’s hooked. One lap down, and Steve H. and Dave Bartel appeared back at the parking lot. Steve was using 5 p.s.i. front and rear on his CAAD with 4.8s, and he had no problems with the roots. Dave was happy he finally got to ride his new Salsa in the snow! 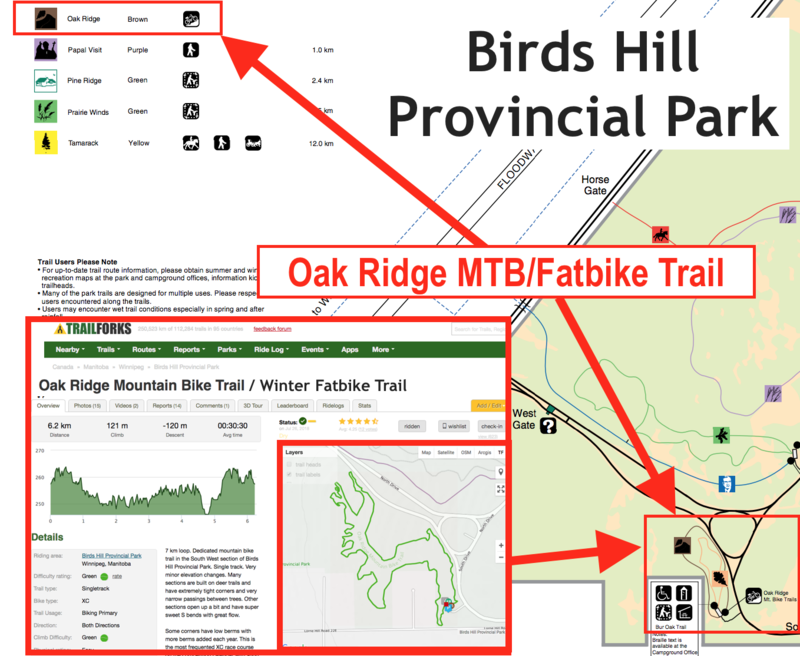 Last night there was an invite from Wayne Bishop at 2 Wheel Revolution for people to go ride with him in the evening at the Bur Oak trails in Bird’s Hill Park. 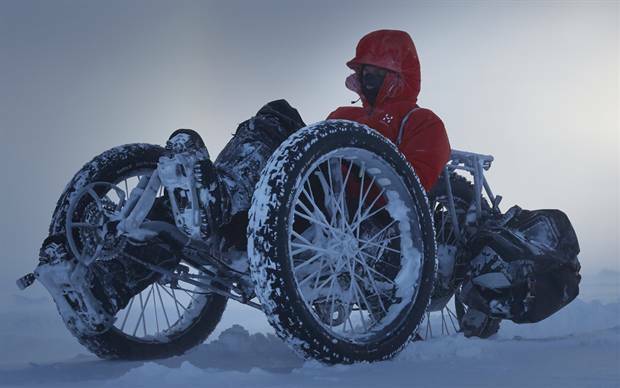 There was light snow on the ground and it is assumed that it would be fat tires only, but there was no requirement. 4 of us attended, all riding fatbikes with tires from 3.8 to 4.8 inches, 2 Specialized Fatboys (1 carbon), 1 Trek Farley 27.5 (carbon) and 1 Salsa Blackborow (mine). The trails were relatively hard packed, with some loose ‘corn’ granular snow in the berms and some small areas of water and no snow cover. There was an overcast and there was almost no light at all, so strong front lamps were mandatory. We were out there for 1.5 hours, and left close to 8:30 p.m. Be sure to be dressed before you go so you don’t get heckled by your friends and given an ultimatum of not being invited anymore! It’s a Fireside Potluck BBQ – bring something Eh! KA-POW!!! 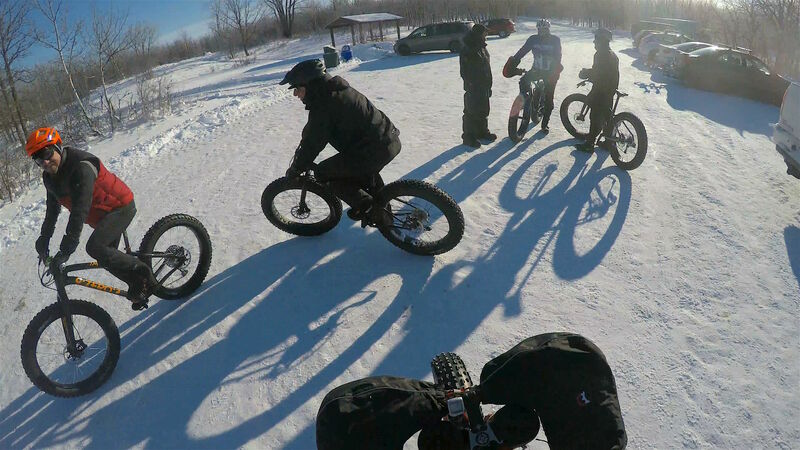 SUPER DUPER FAT BIKE RACE! 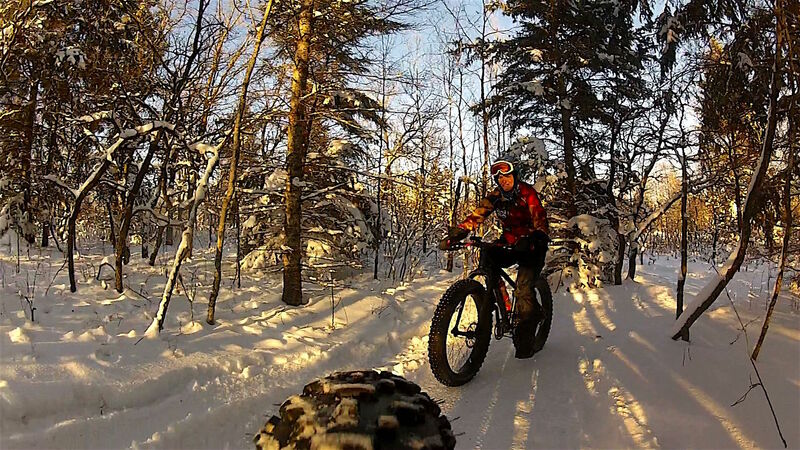 The 2015 Fat Bike Birkie Race held at Cable, Wisconsin, USA, on March 7th was once again the BIGGEST FAT BIKE RACE ON THE PLANET with over 800 registered racers (3/4s on the 47 Km loop and the rest on a 20 Km loop)! Fat Tire Biking continues to explode around the world and no where was it more evident than this past weekend at the Birkie Ski Trails complex, with just 2 days access for fat bike racers to check out the amazing trails, in great conditions (-5 C overnight and +2 at race end), expertly groomed by the American Birkebeiner Ski Foundation and all their organizers and volunteers! The American Birkebeiner Ski Foundation once again but on a world class race event and handled the merry mass of fat bikers! Definitely coming back next year and EVERY YEAR! 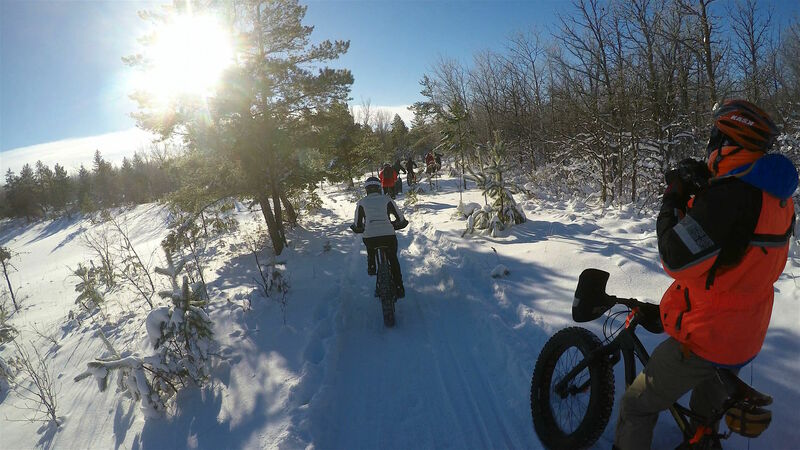 Looking back at a great day of fat biking on the winter trails at Grand Beach Provincial Park in Manitoba, Canada. These are multi-use winter trails (Park designation) that are groomed for classic and skate XC skiing. Others use the trails as well (hikers and snowshoers, but they can mark up the trails). 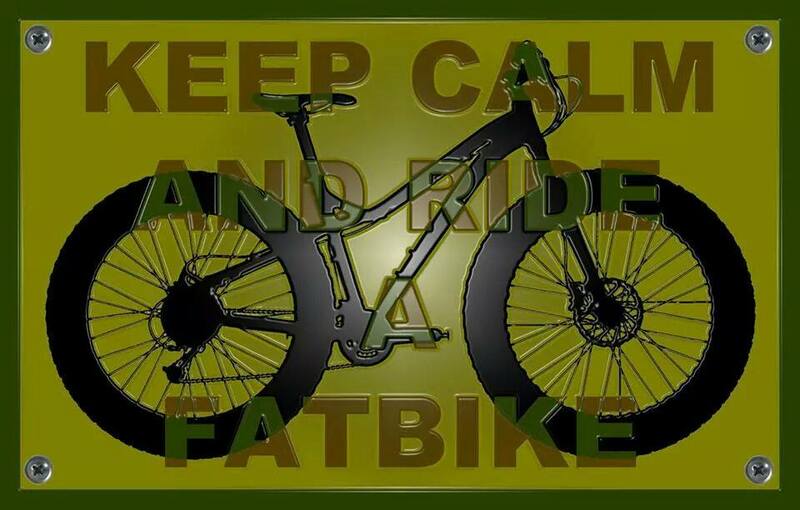 We fat bikers with our wide tires (3.7 inches minimum up to 4.8 inches) and low tire pressure (below 10 PSI is advised) can ‘float’ on the firm-ish packed trails and cruise along at speed, while having great control (good grip). 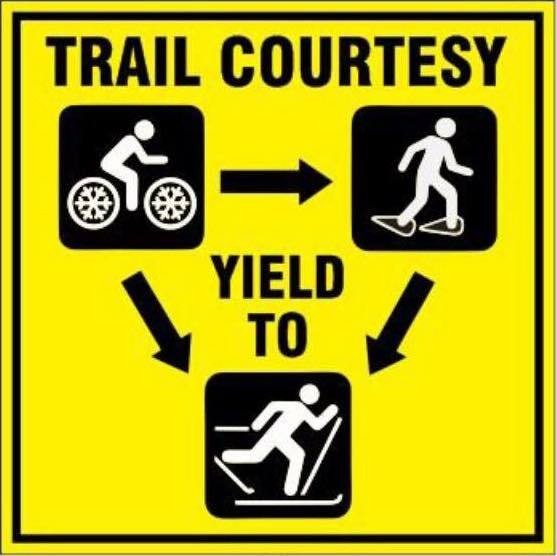 As long as we stay off the set classic ski tracks, avoid the trails once it’s warmer (near O C) and ride in a smart courteous way, we can enjoy the trails and not conflict with others on the trails, especially the skiers. Our speed is very compatible with good skate skiers, while the classic skiers are much slower, so give a friendly warning as you approach them (just like skate skiers have to). Groomed winter trails can be a blast for us fat bikers, as long as we use them correctly and with good trail etiquette! 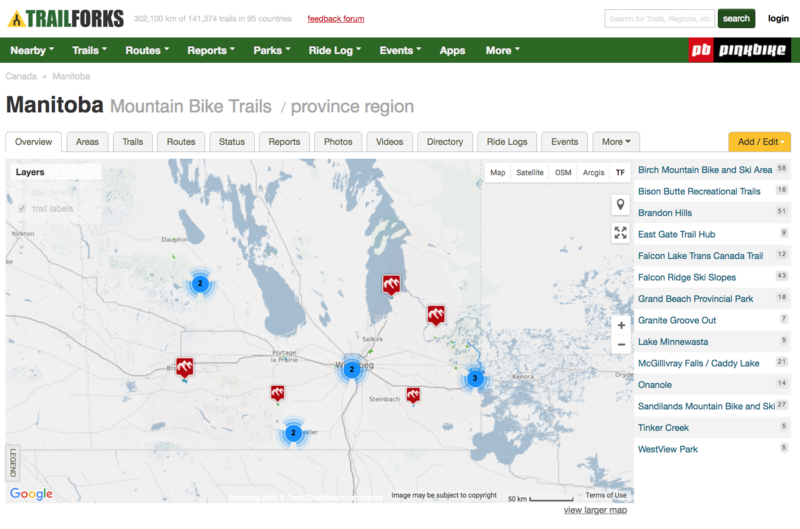 Remember though that while access to these trails may be allowed at this time and at this location (a Provincial Park – not a private ski trail location), this access could be lost. 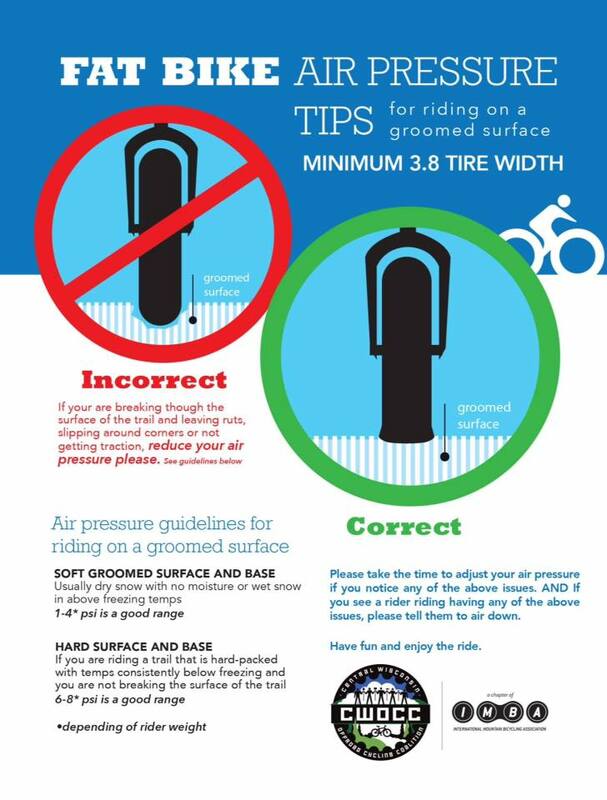 So … 3.7 inch minimum width tires, keep the pressure low and avoid the trails if they are warm/soft! Grand Beach Fat Bike Throw Down #3: Even More Awesome in Pictures! Ok, so there are manyothersuperlatives that I could use to describe how AWESOME this past Sunday’s Throw Down #3 was, but hey, #1 was Awesome, #2 was More Awesome and yes, #3 was Even More AWESOME! Our happy herd (think Big Fat Manitoba Bisons!) of 9 fatties started even earlier in the morning, due to rising spring temps, but in the end conditions turned out to be stellar! 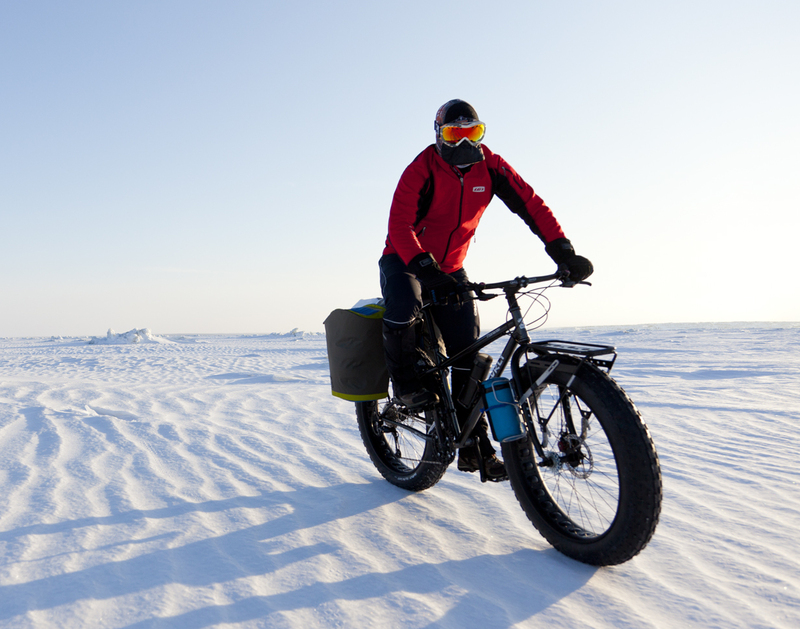 We cruised the Grand Beach ski trails on our low-pressure fat tires and only left dimple marks behind! 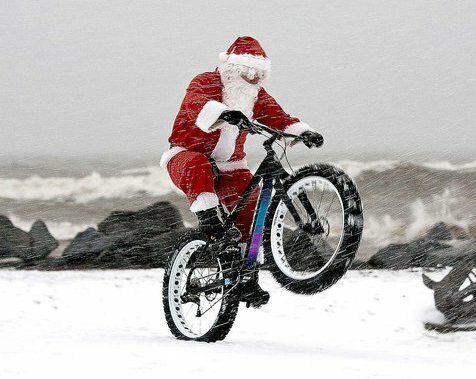 The XC skiers we met and shared our potluck feast with were unanimous in their awe at how smoothly we floated on the packed snow trails and marveled at how cool are bikes are … “you can’t ride a fat bike without smiling“!